Are you looking for an effective dog training collar and lead? Finding the right training tool to work for your particular dog and your individual training style is not always easy. 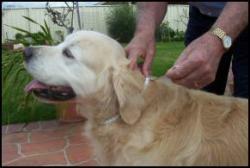 LoveToKnow recently heard of a new training collar from "the Land Down Under", Australia. This collar is called the Vasquez Collar, and it is growing in popularity among dog owners and professionals around the world. Lori Thompson, Vasquez Collar distributor for the United States talked with LoveToKnow about the collar, and introduced the company's quality leashes and long lines. The Vasquez line of training collars and leads are all created with the comfort of the dog and handler in mind. The leads are durable and soft on the hands, and the handcrafted training collars are made of quality soft leather or nylon. Lori, how did you become involved with Vasquez training collars? I was introduced to the Vasquez collar through a local trainer who recommended the "puppy collar" for my mother-in-law's new puppy. 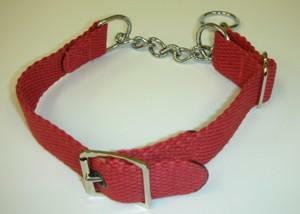 After seeing the collar, I contacted Vasquez Collars myself. I tried the collar and was "wowed" by how well it worked. My Australian Shepherd responded to the collar like no other collar I've ever used. After corresponding with Vasquez Collars and K-9 Equipment in Australia, we created the distributorship here in the USA. The Vasquez Collar has been a success with over 750,000 units sold since its origination in 2004. It is now being offered in the USA for the first time and the response has been excellent. How does the Vasquez collar work? Our secret is the utilization of the traditional check/choker chain together with a fixed collar strap. When the twist link chain is pulled tight, the strap becomes firm around the dog's neck, but due to our unique design, there is no discomfort for your pet. The dog will become conditioned to the sound of the twist link chain and a positive response will result. How do you measure for the proper fit with this collar? Using a measuring tape, measure firmly around the dogs neck, and make a note of the size. An illustrated sizing guide is available at our website. We also have a non-buckled collar available in two sizes for purchase. Are these collars suitable for all types and sizes of dogs? Definitely. The range is comprised of various types of training collars, all using the conditioning effect of the twist link chain. The suite consists of soft suede puppy collars, leather, webbing and specialized "tiny tot" patent leather collars for the smallest dog breeds. There is also a specialized greyhound collar available.The Vasquez Collar has revolutionized the canine training industry. There is a demand from consumers for a collar that utilizes conditioning sounds when training and exercising, yet causes no damage to the larynx of the dog. The Vasquez Collar provides the general public and professionals with a solid option in the wonderful world of dog training! The Vasquez Collar will train, not restrain! Created by Miguel Vasquez, this dog training collar and lead is the official exercise and training equipment for Bark Busters Australia and Bark Buster International, a dog training franchise company. Vasquez equipment is also the tool of choice among several national and international training and agility clubs. In 2001 Vasquez, who is a skilled leather craftsman, was asked to create this collar's prototype by an Australian dog trainer. The trainer believed this design would improve his clients' abilities to handle their dogs. The collar was a blend of a choke chain, standard collar and a martingale. The Vasquez Collar is still much like the original prototype. The trainer's objective was to use the collar as a means to signal to the dog that he should be looking at his handler. Although the collar does include a chain element, it is used to create a distinctive sound to condition a response. Punishment is not the intent of this training tool. It is used as a signal for focus. This training collar should also not be used for dogs that have sound sensitivities, fears or anxieties. The ideal candidate for the Vasquez Collar is the distractable, happy dog that has difficulty listening in busy or unfamiliar environments. If you'd like to take a closer look at the Vasquez collar system, see VasquezCollars.com.au.